Sometimes government regulations and the larger small business community don’t see eye-to-eye on issues, and this is especially true with it comes to new policies and enforcements with the American with Disabilities Act. Though the vast majority of small business owners support the spirit of the law, providing fair access to people with disabilities, some laws and regulations have complicated nuances that challenge easy compliance. While this intention is benign, the reality is that a number of problems have been reported with such an ADA pad. 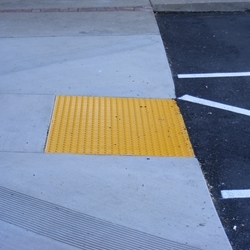 Two types of ADA compliant pads exist: cast pads and retrofit ones. The cast in place ADA pads must be done at the time of building construction as they are set in place when the concrete is poured. The remaining type of pads must be fitted to an existing walkway. Sometimes, the ADA pad is made of inferior materials and therefore does not fit properly. This produces a raised surface that has become a tripping hazard causing a whole other set of problems. So what’s a small business owner to do? It is better to be in compliance with the law than to risk in compliance and the hefty fines. In California for instance, failure to comply with proper use of ADA compliant pad among other guidelines can result in a $4000 fine per occurrence (not including the cost of attorney fees). To minimize costs to businesses, a number of companies like StopSignsAndMore.com are now selling these ADA dome pads without bulk order requirements so you can just order one (for about $100) for your business. New technologies and advances in materials and adhesives have improved the quality of the mats themselves so business owners can be sure they are installing a product that does not cause tripping.